Sequencing data challenge sponges' claim to primacy in animal kingdom. Although they are gelatinous like jellyfish, comb jellies form their own phylum, known as ctenophores. Trees of life typically root the comb jellies' lineage between the group containing jellyfish and sea anemones and the one containing animals with heads and rears - which include slugs, flies and humans. Comb jellies paddle through the sea with iridescent cilia and snare prey with sticky tentacles. They are much more complex than sponges - they have nerves, muscles, tissue layers and light sensors, all of which the sponges lack. 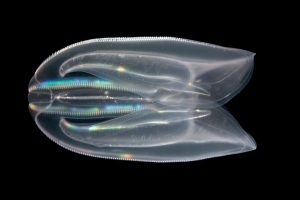 “It’s just wild to imagine” that comb jellies evolved before sponges, says Billie Swalla, a developmental biologist at the University of Washington in Seattle and a leading member of the team sequencing the genome of the comb jelly Pleurobrachia bachei. But the team is suggesting just that, in results they presented at the annual meeting of the Society for Integrative and Comparative Biology, held on 3-7 January in San Francisco, California. “We’ve always thought that predator-prey interactions and sensory adaptations evolved long after the origin of sponges,” Swalla says. “Now we need to imagine early life as a sponge, ctenophore and everything in between.” Because millions of species have gone extinct since animals appeared some 542 million years ago, Swalla says, the ancestor of all animals might look different from modern comb jellies and sponges. Gene families, cell-signalling networks and patterns of gene expression in comb jellies support ancient origins as well. For example, Moroz and his team found that comb jellies grow their nerves with unique sets of genes. “These are aliens,” Moroz jokes. He suggests that comb jellies might be descendants of Ediacaran organisms, mysterious organisms that appear in the fossil record before animals. Indeed, in 2011, palaeontologists claimed that one of these 580-million-year-old fossils resembled comb jellies. Andy Baxevanis, a comparative biologist at the US National Human Genome Research Institute in Bethesda, Maryland, and a leader on the Mnemiopsis genome project, says that comb jellies are the only animals that lack certain genes crucial to producing microRNA - short RNA chains that help to regulate gene expression. Moreover, he points out, sponges and comb jellies lack other gene families that all other animals possess. Sceptics wonder whether a high rate of genetic mutation in comb jellies might be causing the lineage to seem closer to the bottom of the tree than it really is. “In the analyses I’ve done, ctenophores are the most problematic taxon. They jump around depending on which genes you use and which animals you include,” says Gert Worheide, a molecular palaeobiologist at the Ludwig Maximilian University of Munich in Germany. At the meeting, Worheide presented a tree of life created by comparing ribosomal protein sequences. In it, sponges remained rooted in their bottom-most spot.